Gelato has less fat. Gelato is made with milk instead of cream, giving gelato to have about a third of the fat of traditional ice cream. Fat particles actually coat your tongue and inhibit you from getting the full flavor out of your dessert! Gelato is more flavorful. Gelato is whipped slower, allowing for less air, and a more dense consistency. To best illustrate this concept, imagine putting a cup of gelato and a cup of ice cream in the microwave. Melt them both down and the gelato cup will still be almost full while the ice cream cup loses almost 50% of its composition. Less air = more density! Gelato is less likely to give you brain freeze. Gelato is served at a warmer temperature, around 12-15°F, versus ice cream, which is served around 0°F. The colder your treat, the more likely it will paralyze your taste buds, give you brain freeze, and prevent you from experiencing the full flavor. Our gelato is made with real ingredients including: fruit, nuts, spices, liqueurs, chocolates, coffees, tea, and more! We use local products when available. 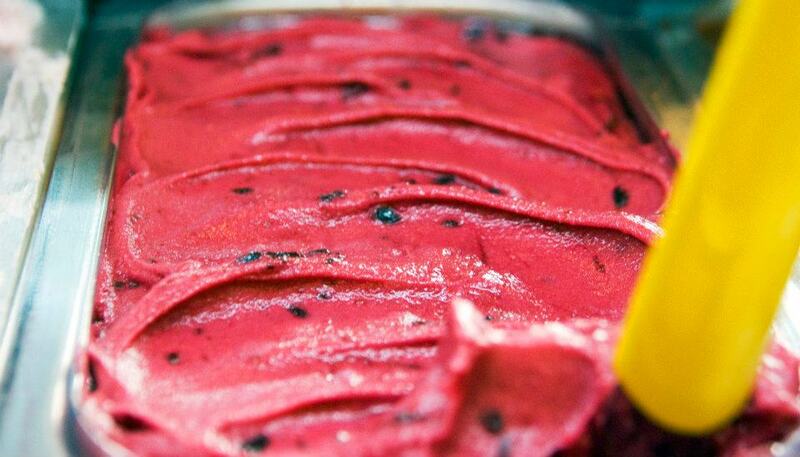 We also dairy-free, vegan sorbetto, made with pure fruit.